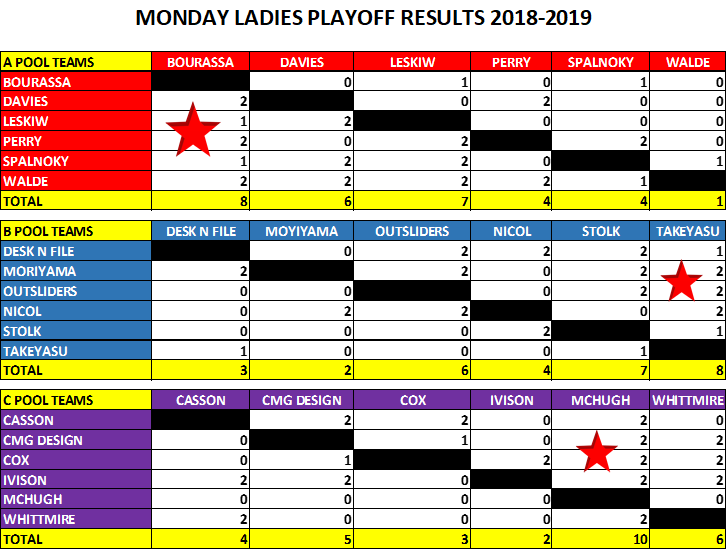 CONGRATULATIONS TO TEAM BOURASSA ON WINNING THE 2018/2019 LADIES LEAGUE CHAMPIONSHIP. CONGRATULATIONS ALSO TO TEAMS TAKEYASU AND MCHUGH FOR WINNING THIER PLAYOFF POOLS! THANK YOU TO ALL THE TEAMS THAT PLAYED THIS YEAR. SEE YOU NEXT YEAR LADIES!! !